KimChikin is a star restaurant that serves South Korean style fried chicken along with tempting cup cakes and frozen yogurt in the district of Bur Dubai, Dubai. It is their first ever outlet in any Middle Eastern country and they have kept everything up to the mark, this includes quality, taste, decor and service. Their food quality and taste can be judged from the decent number of loyal customers in this short span of time, while the service is also rated first class by several guests who have been to this eatery. As far as the decor is concerned, KimChikin Restaurant has got a spacious venue that is colorfully decorated and kept clean as well. Walls of this bistro are extolling KimChikin pretty loudly that creates a good impression on the visitors. KimChikin Restaurant serves frozen yogurt, cup cakes and fried chicken joints like most of the South Korean eateries. The main idea behind forming this chain was not captured from KFC, infect it’s the Big Apple that they have actually followed, but in a different way. Now its unique Korean style fried chicken is making its presence felt in Dubai as well, as people of Dubai are keeping its first ever Middle East outlet quite busy. Their menu is not extensive, but delicacies like chicken wings, fillets and drumsticks marinated either with soy or spicy or garlic is winning the hearts of Inhabitants of Dubai, because unlike KFC their chicken is not marinade with bread but still it’s tender and crunchy at the same time. Due to this reason, their limited menu is declared as their speciality. View the menu of KimChikin Restaurant by clicking here. This international chain of restaurant opens daily and its operational hours last from noon till midnight. Trade Centre Road, Bur Dubai - Dubai - United Arab Emirates. Head south towards Khalid Bin Al Waleed Road/D 79 and then turn right onto شارع الشيخ خليفة بن زايد‎/D 88 to locate KimChikin Restaurant after covering some distance. Take any of these bus numbers 21, 29, 33, 42, 44, 61, C5 or C10 and arrive at the nearest bus stop to the KimChikin Restaurant that is called Centre Point Shopping Centre 1 – Dubai. The gap between these two sites is close to 150 meters and by walk a bus passenger can cover this gap in roughly 2 minutes. 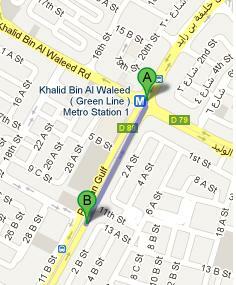 However, to do so bus user needs to head northeast on شارع الشيخ خليفة بن زايد‎/D 88, where this bistro is situated. Check map for directions.